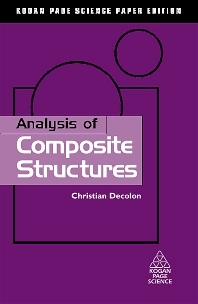 This book provides the basis for calculations of composite structures, using continuum mechanics to facilitate the treatment of more elaborate theories. A composite structure combines traditional materials (such as concrete) with new materials (such as high performance fibres) to explore and develop new structures. The author deals with individual layers in laminate composites, discussing the basic laws that govern mixtures. Contents: Part I: Mechanical Behaviour of Composite Materials: Constitutive relations of anisotropic materials in linear elasticity; Orthotropic layer behaviour; Elastic constants of a unidirectional composite; Failure criteria. Part II: Multi-layer plates: Multi-layer Kirchhoff-Love thin plates; Symmetrical orthotropic Kirchhoff-Love plates; Thermo-elastic behaviour of composites; Symmetric orthotropic Reissner-Mindlin plates; Asymmetrical multi-layer Kirchhoff-Love plates; Cylindrical flexure of multi-layer Kirchhoff-Love plates; Cylindrical flexure of multi-layer Reissner-Mindlin plates. Part III: Multi-Layer Beams: Symmetrical multi-layer beams in tension-compression; Symmetrical multi-layer beams in flexure without transverse shear strain; Symmetrical multi-layer beams in flexure with transverse shear strain. Appendices: Global Plate Equations: Global plate equations neglecting large transverse displacement; Global plate equations for large transverse displacements; Global plane equations: Kirchhoff-Love theory of variational formulation; Global plate equations: Reissner-Mindlin theory variational formulation. Associate Professor of Mechanics at the Conservatoire National des Arts et Métiers (CNAM France), at Ecole Supérieure de Conception et de Production Industrielles, France and at Centre d’Actualisation des Connaissances et de l’Etude des Matériaux Industriels, France. He is co-author of six books on subjects in material science.